Winter is on its way and that means cold feet are coming too!! I HATE having cold feet but sometimes I just don't have the hands or time to go into the bedroom, find a pair of socks and put them on! I like to just slip into a pair of slippers to walk around on the cold floors and I especially like to slip into a comfortable pair of slippers after my shower so I don't have to step on the cold bathroom floor! Now COMFORT is the key word here because I hate those cheap slippers that have a hole in the bottom (exposing your feet!) after a week of wearing them or slippers that just don't offer any support for the feet or knees! That is why I am absolutely LOVING my new Acorn slippers! They are by far the most comfortable slippers I have ever worn and they are so warm at the same time! My favorite part is how they can be worn inside AND outside - I hate when I have to run outside and have to change shoes to not ruin my slippers! Now I never have to do that again with my Acorn slippers! Acorn's goal is to bring the "Comfort on Earth" to consumers who value quality, workmanship, and performance. From the original Slipper Sock to technologically advanced indoor/outdoor footwear, Acorn now offers consumers an expansive and varied collection of indoor and outdoor footwear appropriate for all seasons. I generously received the super comfortable Ragg Time Moc Slippers for Women. These slippers feature wool-blend uppers and a handsewn moccasin construction. 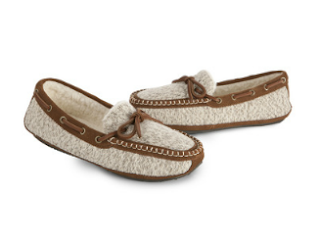 They are the classic moccasin style that is so popular these days but adds super comfort and durability because it is fully lined in soft wool-blend berber fleece and has durable suede detail on topline and canoe moc sole. They are so comfortable because of the high density comfort foam from the heel to toe with raised EVA heel wedge for stability and support. The non-slip weatherproof sole allows for indoor/outdoor wear and that's what makes these Acorn slippers stand above the rest! I definitely don't have another pair of moccasins like these in color or comfort and I can't get myself to take them off at night! The only change I would make is to make the colors a little more feminine - maybe a different color tie and seam instead of brown. But overall, I love everything about these Acorn slippers! And check out this great contest that Acorn is launching soon! On October 1, Acorn will launch their "Love You" contest on Facebook. Acorn has created a special Facebook application where contestants can create their own self-portrait. Contestants can either use pre-selected imagery and text, or upload photos from their personal computers. The goal is to create a visually-appealing self-portrait of creativity and self-expression. Once completed, entrants are encouraged to earn votes on their ads by sharing them on Facebook, via email, and on Twitter using. All entrants and voters will receive a coupon for 20% off their next Acorn purchase in return for participating. Creators of self-portraits with the most votes will be in the running to win one of ten $500 gift cards from Acorn, the chance to be an Acorn product tester, and the opportunity to be featured in an Acorn ad campaign. The contest begins October 1, 2012 and runs through the end of November 2012. For full contest details, or to participate, visit www.facebook.com/AcornFootwear. Acorn. (I Definitely) Love you. Buy It: You can purchase the Ragg Time Moc Slippers for Women for $80.00 on the Acorn website. Win It: Acorn is generously offering (1) Ragg Time Moc Slippers to a lucky winner!